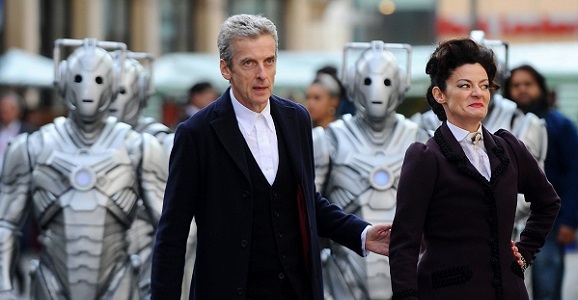 “Dark Water,” the first part of Doctor Who‘s Season 8 finale, dealt with an organization that calls itself 3W (Three Worlds), one that uses “Afterlife means after care” as its mission statement. Things are said that imply corpses experience pain during cremation, and that post-death medical research also causes dead bodies discomfort. And anyway, the episode inevitably explains all this vague theism away by revealing Missy to be the new Master, and that she’d actually just been trapping dying people’s minds to turn them into Cybermen. Of course, that in and of itself could also be met with some crabby naysayers, but the point is: it was all a villainous plot, not a claim from showrunner Steven Moffat that heaven exists and that we’re all just soul-filled bodies waiting to get there. I suppose it says something that more people complained about mentions of an afterlife than they did about the Master being a female. (Granted, I haven’t actually read through the complaints or anything.) There was talk before Peter Capaldi joined about a female Doctor serving as the 12th incarnation, but that obviously didn’t happen, at least not this go-round. Now that that’s all been settled, take a peek at the preview for the season finale’s conclusion below. Find Doctor Who on BBC America this Saturday night. Perhaps this episode will piss people off by having someone do a magic trick.